homemade tortillas & tacos & guac, oh my! !!!!!!!!! i don't have much to say here except i love tacos, i could eat tacos everyday, and now i have all the equipment to make handmade tortillas at home. ev.er.y.day. todos los dias. if i so desire. ole! thank you to my sweetie petey pablo for supplying me with all the things i need these past two christmases to make homemade tortillas! a cast iron tortilla press, a flat cast iron skillet, taco racks, and a tortilla warmer. also a legit molcajete from last christmas for my signature guacamole. good times ahead. muchas gracias, pedro. in the red le creuset cocotte is a spicy pineapple salsa that i will share later :) this week we made tacos with spam, spicy pineapple salsa, and cilantro and they were sewwww gooood (especially with homemade tortillas). if you're a spam skeptic like i was for many moons, puhlease give it a try. grill it if possible. "it tastes like ham, and then it tastes like bacon!" - my tagline at every bbq in the last 7 years where pete would be grilling up spam and people would inevitably turn their noses up at it. we've converted many a'friend. heEheHHHH. spaaaaaam. who knew. for the sake of this first homemade tortilla taco fiesta, i just went with simple veggie tacos with black beans and salsa as the oomph of the tacos. just simmer your favorite salsa in a pan for about ten minutes with a can of black beans. i love this fresh salsa from reser's. the texture and flavor come together so deliciously, and it's so simple. and easy to keep as leftovers and reheat when needed. homemade tortillas are far superior to any store bought tortillas, in my opinion. the best store bought tortillas are these ones, though! si si! 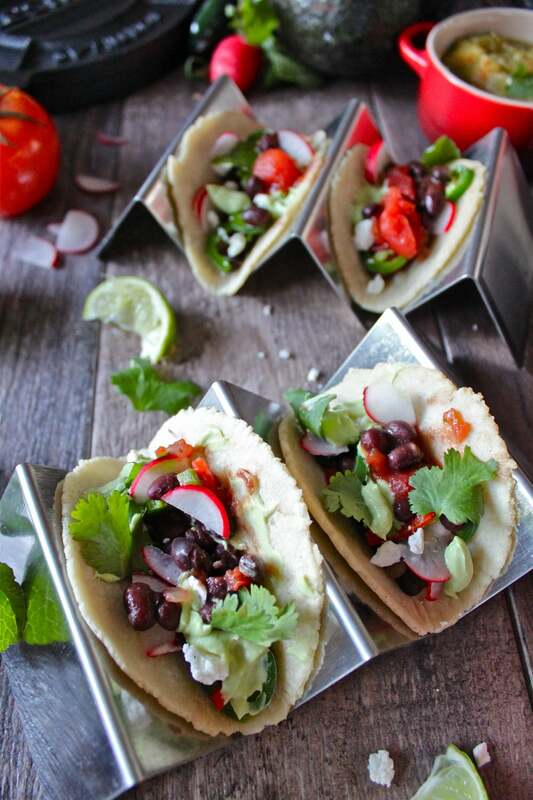 top these black bean & salsa tacos with avocado creme, jalapeño or chile slices, radish slices, a crumbly white cheese like cojita, cilantro, y lime! ps. i am aware that the opposite side of the taco racks hold 3 tacos. i just wanted 2 and 2, amigo! Combine the ingredients in a bowl and gently knead until a dough forms and is not sticky. Add extra water or masa depending if the dough is too dry or too sticky. Form dough balls about the size of a golf ball. Let sit in a bowl covered by a warm wash cloth if you aren't pressing the tortillas right away. Set a piece of plastic wrap on each side of your tortilla press. Place a ball of dough in the center, close the top, and press the lever down firmly. Press less firmly if you want a little bit thicker tortilla. Open the press, and carefully peel the tortilla off the side of the plastic wrap that it is stuck to - gently pass the tortilla from hand to hand to keep it from sticking. Gently place it onto a cast iron skillet that has been lightly greased or sprayed with cooking spray and heated to medium. Cook the tortilla about 30 seconds, and flip with a spatula or with your fingers if you're legit. Let cook another 30 seconds, place the tortilla in a tin foil lined tortilla warmer (as shown in the photos). Repeat until you have a nice little stack of tortillas ready for the taco fixins. Place all the ingredients in a food processor or blender and blend until smooth and creamy! Assemble tacos as you prefer! The combinations are infinite. tacos, i love youuuuuuuuuuuuuuuu. meet you in mehico. mwah.